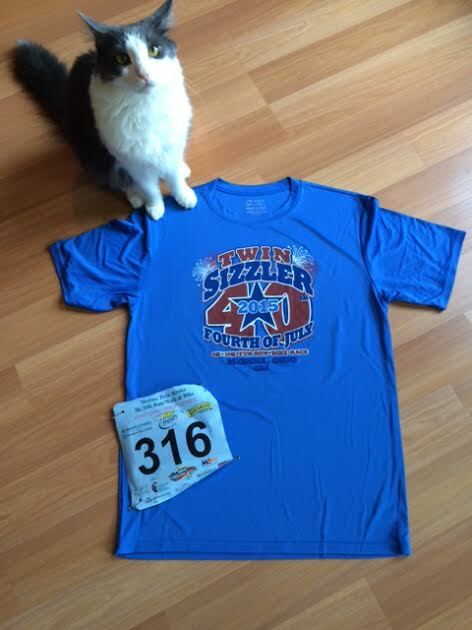 Last Saturday, July 4th, I ran my third Twin Sizzler 5k. 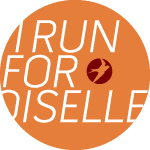 This year I decided to run just the 5k and skip the 10k. The weather was surprisingly cooler for race day, with 65 degrees at the start and some slight wind a few times on the course. The race started at 7:45, but I got down to the square by 7:15 to pick up my bib and shirt and hit the restroom before the start. I got a little under a mile in for my warm up and was ready to run. I didn’t have a certain time I was focused on, I just knew I didn’t want to go out too quick, and I didn’t want to have a meltdown on the uphill finish. Surprising, I was actually pretty relaxed. That is until a minute before the race started and my stomach was a mess. The race started and I realized I was a little too far back in the pack. Instead of going out too fast, I was going out too slow, somewhere around a 9:07 pace. I started to weave in and out of the group to find a better spot, and finally settled on an 8:45 pace. My stomach was still hurting and I was too afraid to push myself any faster at that point. The course starts on the square with a nice downhill onto Rt. 57 out of town. Eventually the road begins an incline and I was happy I didn’t have to do the 10k after this, with it’s continual incline into Montville Township. Just before our first turn we came across the first mile marker and a water stop. I skipped the water and was starting to feel a little better. Starting the second mile, it was refreshing that for once I didn’t feel like death, clinging onto a time that I wouldn’t be able to hold. I was feeling better with every step I took and wanted to base this next mile off of feel, not time. During the second mile we went through some developments and had some rolling hills along the way. They didn’t feel as bad as they typically do and I was able to pass people as I made my way along the course. I continued along, quietly bringing my pace down, and keeping my eyes off my Garmin. With the last mile ahead of me I knew I wanted to pick up the pace. I also knew the finish would be difficult, and I was still unsure of what my stomach had planned. I told myself I’d be ok with an 8:20 pace, but again wanted to go by feel, rather than time. Somewhere in the beginning of the last mile, I noticed a gentleman was near me and would stay around my pace. He’d push when I pushed, and back off when I backed off. It was nice to have a little company, even though we didn’t say anything. As we made the turn down South Court, I tried to get myself in the zone. I took advantage of the short downhill and mentally prepared myself for the finish. We turned right on South Street, and then left on South Broadway. We were met again with my favorite part, the brick road. I started to pick up my pace a bit, but was careful not to trip on any loose bricks. I could feel the energy that had been saved up and hoped it would stay throughout the rest of the race. We passed the intersection of 57 and memories of my Medina Half finish crossed my mind. Even though I had started with a sour stomach, it was no where to be seen and my legs wanted to take control. We passed the railroad tracks, and then started our long incline past East Smith. As I took each step up hill, I knew I would have a much better finish than before. I kept picking up the pace, trying to go faster. With just a small section left I gave it everything I had and sprinted up the rest of the hill and into the finish. I turned around just in time to see the silent gentleman finish and congratulated him on the race. For the first time, quite possibly ever, I ran negative splits on my 5k. And I felt great after I finished. I didn’t run a PR, but I ran a smart race and I ran based on how I felt rather than checking my watch everything 30 seconds. While I’m not sure I’ll ever PR on the Twin Sizzler course, I was able to run my fastest Twin Sizzler to date. And now I know where I stand time-wise on the 5k and I have an idea of where I can be if I really push myself. There is no doubt that I can drop under 25 minutes for the 5k again, but unfortunately a sub 23 is probably something that I left in college. 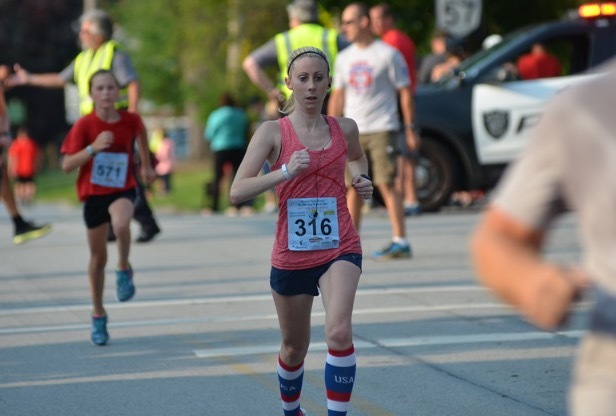 Negative splits in a 5K – IMPRESSIVE! Nice job on your race!! !